Nuwa Wamala -Nnyanzi a celebrated, self-taught, Ugandan artist of international repute was born on October 28, 1952 in Uganda. His late father was a laboratory assistant and his mother is a retired midwife and nurse. Nnyanzi is married with two children. He attributes his talent and success to the Grace of God. 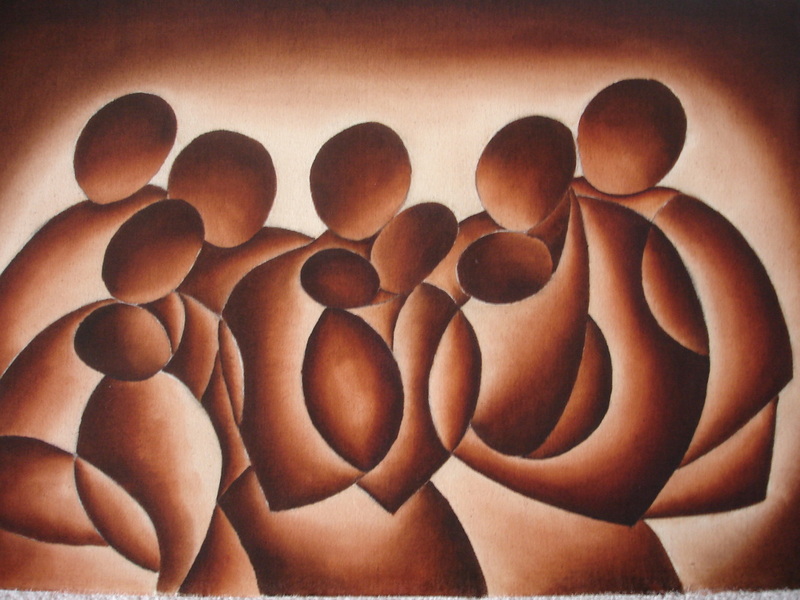 Nnyanzi's works of art are in batik, pastel, acrylic, oil and water colors which are earthy, vibrant and reflective of the strong and sweet African sun. The lines of his works flow and turn with the fluency of an African drum. Looking at his art, one feels the vibrant life in an African setting. 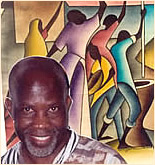 Nnyanzi started painting in 1978 while in exile in Nairobi, Kenya. He has held many exhibits and slide\talk presentations in Africa, Europe, North America, Japan and Australia. In 1996 he had the privilege and honor of hosting among many other dignitaries, the late Ron Brown, who was Secretary of Commerce of United States of America, at his studio/gallery in Kampala, Uganda. 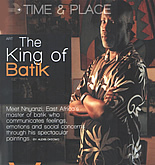 Although Nnyanzi works in many other media, he specializes in batik painting. Nnyanzi through extensive research and experimentation has managed to come up with a style where more than one dye can be applied to get tones and varied shades. The result of which is remarkable. After all the required dyes have been applied, the wax is removed by placing the batik between two absorbent pieces of paper and pressed with a very hot flat iron. The wax melts with the heat and is absorbed into the sheets of paper, leaving the batik crisp clean. The rugged edges of the images are retouched using black dye in a fountain pen. 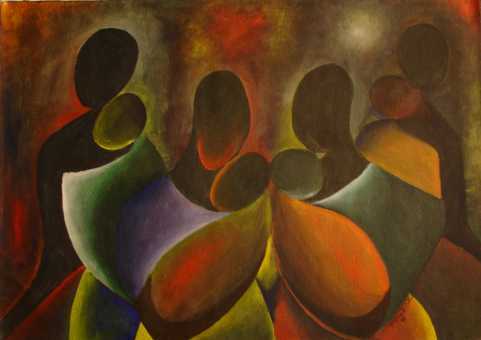 Nnyanzi's works of art are executed in multi and mono hues. He intelligently and successfully manipulates the colors and shapes with such ease that leaves the viewer spell-bound. Nnyanzi's choice of titles for his pieces too, is a work of art in itself. The titles are as descriptive and reflective as they are poetic, which makes them an integral part of the art itself. 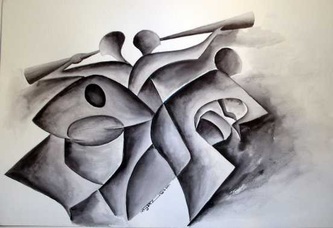 Nnyanzi's concern for humanity and cultural values manifests itself vividly in his art, which successfully captures and depicts the emotions and movements of human beings. In his black and white serigraphs, using sensuous and flowing lines, Nnyanzi captures traditional African dancers and musicians in action so successfully that the rhythm is actually felt by the viewer. The black and white pieces, produced on pure cotton fabric can be aptly described as artistically eloquent and graphically articulate. Some of Nnyanzi's batik paintings have been published in open and limited edition lithographs. Nnyanzi's evocative and often moving art strikes a responsive cord. That, and his wide knowledge of Ganda culture and traditions plus his natural and eloquent articulation of cultural and social issues enable his audience to enjoy while being educated during his presentations. His knowledge of Ganda culture and traditions and also of the neighboring people has its roots in the close association his family has had with the royal courts of Buganda, Bunyoro and Tooro for a number of generations. Nnyanzi, himself is a descendant of Baganda chiefs, among whom was his great grandfather Paulo Nsubuga Bakunga, who participated in the making of the 1900 agreement, which laid the foundation for the creation of the modern-day Uganda. His paternal grandfather, Kesi Mukasa Bagandanswa was among the first Ugandans to visit the United Kingdom as a reward for his swift grasp of the English language at the beginning of the twentieth century. Nuwa Wamala-Nnyanzi a minister of Internal Affairs in the Buganda Kingdom since 1992 was responsible for the successful protocol and security co-ordination during the coronation of Ssabasajja Ronald Muwenda Mutebi II, as the 36th Kabaka King of Buganda Kingdom in July, 1993. Nnyanzi now a Minister of Arts and Social Welfare was chairman of the security committee of one of the world's most colourful weddings, billed to be "The Wedding of the Millennium". This sculpture was part of the World of Coca Cola International Exhibit commissioned in 1997. In addition to many art exhibits he has held around the globe Nnyanzi has also made several slide/talk presentations on the Baganda, Banyoro and the neighboring peoples at Universities, Colleges, Seminars and workshops. Among the Universities and Colleges where he has made presentations are: Makerere University, School of Industrial and Fine Art, St Lawrence University NY, Kenya program, Marist College, New York. Other venues, among others have been Uganda Museumand the Uganda National Cultural Center to mention but a few. Nnyanzi's art has inspired many scholars who have used it as a subject of reference when writing their theses and art books. Many art students have also carried out their industrial training and internship at his studio -Nnyanzi Art Studio. Between 1994 and 1996 he hosted students of anthropology from St Lawrence University, New York on the Kenya program. Nnyanzi has also appeared as guest speaker at fundraising functions and he has on several occasions donated his art in support of charity. Nnyanzi's batik painting "Homage to the first born" is featured in the UNICEF greeting card collection. Another of his works, a 1987 batik painting "Desperately longing for shelter" was selected to be used in minting a medallion by the United Nations High Commission for Human Settlement [HABITAT] to be presented to distinguished world leaders. In 1993, during the Pope's visit to Uganda, Nnyanzi's design, "The Pentecost" was used in executing a wood sculpture, which was presented to Pope John Paul II. "The Xhosa" In 1995 Nnyanzi was commissioned by the University of Transkei [UNITRA] in South Africa to paint a mural (depicting Xhosa life-style) in their administration block. The American Red Cross in 1993 used Nnyanzi's design the "Dialogue on the cover of the book they published on AIDS. 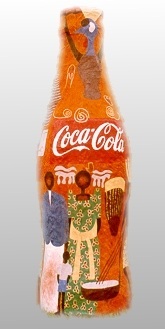 Coca-Cola International in 1997 commissioned Nnyanzi to make an eight foot Coca Cola bottle portraying Uganda's rich cultural heritage. In 1998,the head of the Roman Catholic Church, who is also the chairman of the Ecumenical Movement in Uganda, commissioned Nnyanzi to produce portraits and a collage which were presented to the Archbishop of Canterbury when he visited Uganda. Nnyanzi has chaired many art judging panels as well as beauty pageants. Among those is the National poster contest under the auspices of the United Nations fund for Population Activities [UNFPA]. Nuwa Wamala-Nnyanzi and, his art have been widely covered by both local and international media among them are: British Broadcasting Corporation [BBC], REUTERS TV, The Christian Science Monitor, The South African Broadcasting Corporation [SABC], The Cable News Network [CNN].